Sepsis is the systemic inflammatory response to infection and can result in multiple organ dysfunction syndrome with associated high mortality, morbidity and health costs. Erythropoietin is a well-established treatment for the anaemia of renal failure due to its anti-apoptotic effects on red blood cells and their precursors. The extra-haemopoietic actions of erythropoietin include vasopressor, anti-apoptotic, cytoprotective and immunomodulating actions, all of which could prove beneficial in sepsis. Attenuation of organ dysfunction has been shown in several animal models and its vasopressor effects have been well characterised in laboratory and clinical settings. Clinical trials of erythropoietin in single organ disorders have suggested promising cytoprotective effects, and while no randomised trials have been performed in patients with sepsis, good quality data exist from studies on anaemia in critically ill patients, giving useful information of its pharmacokinetics and potential for harm. An observational cohort study examining the microvascular effects of erythropoietin is underway and the evidence would support further phase II and III clinical trials examining this molecule as an adjunctive treatment in sepsis. Sepsis is the systemic inflammatory response to infection. The clinical syndrome can range from mild constitutional upset to overt septic shock with the failure of multiple organ systems, reflecting the complex pathogenesis of sepsis involving immunological and coagulation pathways [1, 2]. The burden from sepsis remains high with worldwide incidence ranging from 0.5 to 1.5 per 1,000 population, a mortality rate at 1 month of 30% from recent randomised trials, and costs of between $11,500 and $22,000 per hospital episode [3, 4]. The modulation of single inflammatory pathways (for example, TNFα ) and generalised immune suppression with steroids [6, 7] has proved unsuccessful in the past, reflecting the complex pathogenesis of sepsis and leading to a reevaluation of the mechanisms that may underlie it. Several laboratory and observational studies have shown that accelerated apoptosis occurs in sepsis and may explain both the organ failure that is a feature of it and secondary infections that can intervene [8–10]. The haematopoietic growth factor erythropoietin (EPO) reduces apoptotic cell death and attenuates inflammation, with cytoprotective effects in both animal and human models of ischaemic injury. EPO also has putative vasopressor actions. A complete summary of the extra-haemopoietic effects of EPO in specific organs is beyond the scope of the present discussion so readers are referred to reviews [11–13]. The present communication seeks to explain the role of apoptosis in sepsis and to summarise the available data on EPO and its extra-haemopoietic effects in sepsis and critical illness. Apoptosis is programmed cell death, distinct from necrosis, limiting damage around the penumbra of an injury. This process is important in the homeostasis of the inflammatory response, and delayed neutrophil apoptosis has been implicated in mediating tissue damage in acute respiratory distress syndrome and systemic inflammatory response syndrome [14–16]. That said, accelerated apoptosis has been clearly identified in postmortem studies of septic patients in lymphoreticular tissues and in gut columnar epithelium, conspicuously absent in nonseptic controls . A postulate is that death from sepsis occurs due to overwhelming infection in the face of immuno-suppression due to lymphocyte apoptosis . Indeed, outcome is worse in septic patients with lymphopaenia  and in those with evidence of lymphocyte apoptosis . Apotosis of gut epithelium may also lead to bacterial and endotoxin translocation due to a breach in the integrity of the bowel wall. Apoptotic cells per se may have detrimental effects as transfusion of apoptotic splenocytes into septic mice worsens outcome compared with both controls and transfusion of necrotic splenocytes . Modulation of different parts of the apoptosis pathway has been shown to alter outcome in animal models of sepsis: inhibition of Fas/Fas ligand binding, a known promoter of apoptosis, leads to attenuation of liver damage in septic mice [22, 23], and overexpression of the anti-apototic B-cell lymphoma protein 2 (Bcl-2) in transgenic mice reduces lymphocyte apoptosis and improves survival in response to sepsis . Caspases are integral in the downstream promotion of cellular apoptosis. The use of caspase inhibitors has been shown to improve survival and reduce lymphocyte apoptosis in one model of sepsis  and to reduce apoptosis in acute lung and kidney injury . Both immune-mediated and coagulation pathways are deranged in sepsis, the endothelium being pivotal to these processes . Studies in which endothelial cell lines were infected with bacteria such as Escherichia coli and Staphylococcus aureus have shown consistent evidence of endothelial cell apoptosis [27–31], but in vivo work has failed to show consistent results [32, 33] with the easy detachment of cells into the media, making detection difficult. Although recent data have questioned the balance between apoptosis and necrosis in the outcome from sepsis , on balance the data would suggest that attenuation of apoptosis is a fruitful line of investigation to pursue. EPO is a 30.4 kDa glycoprotein hormone and member of the type I cytokine family. Its main function is the regulation of red blood cells through a specific cell surface receptor (EpoR). Stimulation of EpoR reduces apoptosis of red cells via the Janus tyrosine kinase 2 (Jak-2) pathway, increasing their lifespan . After successful clinical trials of EPO in the treatment of anaemia of end-stage renal failure [36, 37], its use has been extended to the treatment of anaemia in malignancy, human immunodeficiency virus infection, prematurity and myelodysplasia . The principle site of secretion is the peritubular interstitial fibroblasts of the renal cortex in response to stabilisation and DNA binding of hypoxia-inducible factors . Several inflammatory cytokines increase expression of EpoR and EPO, including insulin-like growth factor, IL-1β, IL-6 and TNFα, suggesting a role in inflammation [39–41]. Embryologically, EPO-EpoR has a signalling role in angiogenesis and brain development, and EpoR is widely expressed in the brain, retina, heart, kidney, smooth muscle cells, myoblasts and vascular endothelium, suggesting pluripotent effects in normal health and development . After evidence of a beneficial effect of systemic EPO administration on the course of ischaemic brain injury in mice , several animal models of ischaemia/reperfusion have confirmed the cellular, anti-apoptotic effects of EPO in neuronal, renal, endothelial and cardiovascular damage [43, 44]. 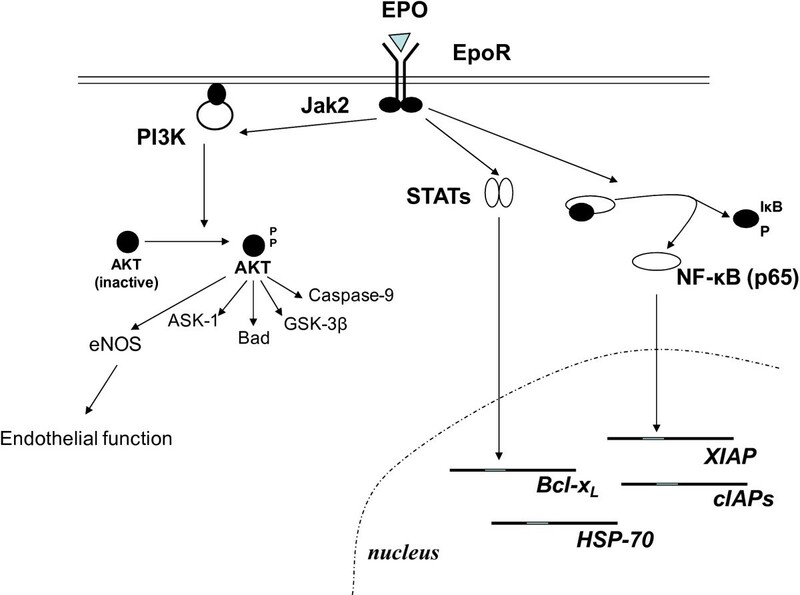 In these models, EPO prevents apoptosis via a number of pathways, dependent on receptor activation by the Jak-2 pathway (see Figure 1). Protein kinase B, an important downstream substance in the Jak-2 pathway, regulates multiple pro-apoptotic and anti-apoptotic intermediates, including glycogen synthase kinase-3β (GSK-3β), Bcl-2-related death promoter, and the pro-apoptotic forkhead box transcription factor O3a, rendering it unable to activate transcription and nuclear genes involved in apoptosis. EPO increases the expression of several intrinsic inhibitors of apoptosis, including Bcl-2, X-linked inhibitor of apoptosis protein and proto-oncogene serine/threonine-protein kinase 3. In neuronal cells, stabilisation of the transcription factor NF-κB is essential for the anti-apoptotic effects of EPO, although this not been seen in other cell types. Anti-apoptotic pathways regulated by erythropoietin. The binding of erythropoietin (EPO) to its dimerised cell surface receptor causes conformational change, leading to activation and autophosphorylation of Janus-tyrosine kinase-2 (Jak2). Jak2 phosphorylates nine tyrosine residues in the intracellular portion of the receptor, which allows interaction with signal transducers and activators of transcription protein (STATs) signalling molecules, and activates phosphoinostitol-3 kinase (PI3K) and hence protein kinase B (AKT). AKT regulates multiple pro-apoptotic and anti-apoptotic intermediates, including glycogen storage kinase-3β (GSK-3B), B-cell lymphoma protein 2 (Bcl-2)-related death promoter (Bad) and the pro-apoptotic forkhead box transcription factor O3a (FOXO3a), rendering it unable to activate transcription of apoptotic signalling genes. STATs cause transcription of the anti-apoptotic molecules Bcl-2 and proto-oncogene serine/threonine-protein kinase 3 (PIM-3). EPO also activates NF-κB, possibly in a cell-type-specific manner, which alters transcription of pro-apoptotic and anti-apoptotic proteins including inhibitor of apoptosis proteins. ASK-1, apoptosis signal-regulating kinase 1; Bcl-xL, B-cell lymphoma extra large; cIAP, baculoviral inhibitor of apoptosis protein repeat-containing protein; eNOS, endogenous nitric oxide synthase; EpoR, erythropoietin receptor; HSP70, heat shock protein 70; XIAP, X-linked inhibitor of apoptosis protein. A carbamylated form of EPO (CEPO), which has low affinity for the classical EpoR and does not cause erythropoiesis, has shown significant anti-apoptotic effects in culture and organ protection in a variety of animal models [45, 46]. It is postulated that CEPO signals through a heteroreceptor involving the EpoR and two common β chains of the IL-3 receptor (CD133) . There are clear advantages to an agent that harnesses the beneficial properties of EPO without significant erythropoiesis, and also does not cause platelet and endothelial activation and hence is associated with a less thrombogenic profile . Pyroglutamate-helix B surface peptide (ARA 290, Araim Pharmaceuticals, Ossining, NY, USA) is an erythropoietin analogue modelled on a portion of its 3D structure and although only 11 amino acids long seems to show good neuroprotective and tissue protective effects without eliciting significant haemopoietic or endothelial effects thought to underlie the prothrombotic tendency of EPO . While these molecules are attractive alternatives to EPO with the potential for less side effects these endothelial and pressor effects may actually be beneficial in sepsis syndromes. Septic shock is associated with peripheral vasoplegia , requiring catecholamines such as norepinephrine to maintain blood pressure and organ perfusion . The large doses required may cause unwanted side effects, including reduced cardiac output, mesenteric ischaemia and digital gangrene . Vasopressin offset the dose of norepinephrine required to maintain adequate mean arterial pressure (MAP) in a large randomised study ; however the side effect profile was similar to norepinephrine suggesting a role for other pressor agents. Twenty-five to 30% of patients with renal failure treated with EPO develop worsening hypertension . Postulated mechanisms include alteration in blood viscosity, enhanced vascular reactivity and improved vasoconstriction following correction of anaemia . There is accumulating evidence, however, of direct vasopressor effects of EPO, through interaction with EpoR expressed on vascular smooth muscle cells . EPO causes an increase in the cytosolic-free calcium in vascular smooth muscle cells, and augments the effects of angiotensin II [55, 56] in addition to upregulating angiotensin II receptor expression . Synergistic effects on cellular calcium levels are seen with endothelin-1 and noradrenaline [56, 58]. Activation of inducible nitric oxide synthase leading to increased nitric oxide plays an important role in the pathogenesis of vasodilatory shock . EPO attenuates the effects of interleukin-1β on nitric oxide synthase via direct stimulation of EpoR, providing an alternative pressor effect [59, 60]. In addition, EPO increases stability of endogenous nitric oxide synthase via protein kinase B-dependent phosphorylation, and induces increased mRNA expression. In vivo, these changes generate vessel wall tension as shown in isolated rat mesenteric and renal resistance arteries . This appears independent of α- adrenergic stimulation, offering a different pathway for vasoplegia correction. In haemorrhagic shock, the selective α-adrenergic agonist phenylephrine has attenuated effects in intact aortic rings. Pretreatment with EPO reverses this effect with significant increases in the MAP and length of survival of rats . No randomised study has examined the vasopressor effects of EPO in humans; however, in patients with renal failure and on haemodialysis there is a consistent increase in the MAP in response to a single dose of EPO, mediated in part by an increase in the serum endothelin-1 level . In addition, EPO led to a marked increase in the vasoconstricting effects of noradrenaline determined by forearm blood flow in chronic renal-failure patients . In a case series of two patients with vasodilatory shock, administration of 10,000 IU EPO every 4 hours for 24 hours resulted in a brisk and sustained increase in MAP and a rise in the peripheral vascular resistance . EPO has vasoconstrictor effects that could be useful in improving MAP and blood flow to the tissues in severe sepsis and septic shock where vasopressors are required. There are consistent data from the literature confirming anti-inflammatory and cytoprotective effects of EPO in many different animal models of sepsis and inflammation. Both pre and post insult, the administration of EPO attenuates tissue injury. In a rat model of necrotizing pancreatitis, EPO led to a reduction in all features of sepsis-induced acute lung injury, including circulating proinflammatory cytokines, polymorphonuclear cell accumulation and lipid peroxidation, with better maintenance of microvascular cellular integrity . Similar attenuation of inflammation has been shown in response to zymosan (a Toll-like receptor-2 agonist) in mice with reduced local and systemic signs of inflammation and organ dysfunction and lowered levels of TNF and IL-1β compared with control animals . In a rat model of sepsis induced by intraperitoneal lipopolysaccharide, the Toll-like receptor-4 ligand, the effects on lymphocyte and thymic apoptosis as well as serum nitric oxide production were reduced in the group of animals pretreated with EPO . In murine models of sepsis due to caecal ligation and puncture, administration of EPO post insult is associated with a fourfold improvement in the glomerular filtration rate mediated by protective effects on superoxide dismutase . In addition, improvements in perfused capillary density and tissue hypoxia measured by intravital micros copy and changes in nicotinamide adenine dinucleotide phosphate fluorescence have been demonstrated, suggesting improved microvascular integrity . Aoshiba and colleagues examined the effects of large doses of EPO in attenuating both increasing lethal doses of lipopolysaccharide and caecal ligation and puncture. There was improved survival in EPO-treated mice, with less apoptosis in the lungs, liver, small intestine, thymus and spleen along with reduced inducible nitric oxide synthase expression . Data from clinical studies on patients with myeloma  and patients on haemodialysis  have shown that EPO has direct effects on immunity. In a murine model of myeloma, EPO promotes the development of an antitumour specific immune response via activated CD8+ T cells . Little is known on the expression and signalling of the EpoR in immune cells, however, as the classical EpoR was not detected on human lymphocytes by proofreading PCR  and these observed effects may be mediated by other cells. This is supported by the expression and role of the EpoR on macrophages during wound repair . While positive results in animal models do not always correlate with clinical outcomes, it appears that EPO has significant cytoprotective effects mediated by anti-apoptotic and immune mechanisms that could be beneficial in sepsis syndromes. These effects remain to be confirmed in clinical practice. In septic patients, EPO concentrations are elevated above control levels [77–79] but response to anaemia is blunted [80, 81], with lower levels than in otherwise well, anaemic patients. In clinical studies, concentrations of 300 to 500 IU/kg have been used, with peak serum levels reaching over 5,500 U/l in one trial and 200 times greater than control in another [82, 83]. Once-weekly dosing with 40,000 IU EPO in intensive care patients gave mean serum levels upward of 800 IU/l in the blood, similar to levels found in healthy controls [84, 85]. This compares with peak levels of 150 IU/l in septic shock patients . Many patients with severe sepsis require treatment in critical care units. There are high-quality data on the effects of EPO on transfusion requirements in critical illness. Anaemia in critically ill patients evolves over time such that transfusion is required in 35% of patients requiring intensive care for > 5 days . The largest randomised study of EPO in critically ill patients had significant numbers of septic patients (188/1,460 patients) [87, 88]. Recruitment was 48 hours after intensive care unit admission with EPO being commenced between days 3 and 5. There was no a priori analysis of mortality in septic patients or on total pressor requirements. EPO was associated with a lower mortality at day 29 (8.5% vs. 11.4%), and an analysis of the 793 trauma patients in this study did show a marked reduction in mortality (relative risk, 0.4; 95% confidence interval, 0.23 to 0.69). It is interesting to speculate why this might be. Animal models of traumatic and compressive peripheral and central nerve injury and models of wound healing show consistent cytoprotective effects, with EPO correlating with reduced apoptosis, improved wound healing and reduced inflammation [11, 89]. In addition, rat models of haemorrhagic shock show improvements in haemodynamic stability and markers of organ dysfunction [62, 90]. These effects may underlie the improved outcome; however, clinically relevant thrombotic events were commoner in EPO-treated patients, with a hazard ratio of 1.41 (95% confidence interval, 1.06 to 1.86) occurring in 120/728 patients in the EPO-treated group versus 83/720 in the control group. This prothrombotic tendency has been recognised in other conditions (see below) and raises concerns about target haemoglobin concentrations and dosing. A meta-analysis identified nine trials of EPO in acutely unwell patients , a significant minority of whom had sepsis [84, 87, 88, 92–97]. Recruitment into these studies occurred when either a transfusion trigger was met or after a given time in intensive care (see Table 1). No mortality benefit (odds ratio, 0.81; 95% confidence interval, 0.65 to 1.01) was observed among the studies of high methodological quality. Importantly, EPO doses > 40,000 units weekly were associated with a trend towards more harm. Transfusion independence showed an odds ratio of 0.73 (95% confidence interval, 0.64 to 0.84) in favour of EPO, with a reduction of 0.41 units of blood transfused. Interpretation of these data in light of this discussion is problematic as anticipated nonhaemopoeitic benefits of EPO are likely to accrue from administration in the early stages of sepsis. Nonetheless, data from these studies inform on potential harm, dosing and pharmacokinetics. In addition, changes in transfusion practice in 1999 accepting a lower threshold for transfusion make studies before and after this date difficult to reconcile . Number of patients with sepsis is shown and the timing of erythropoietin use. Hb, haemoglobin; HCT, haematocrit; ICU, intensive care unit; ns, not specified. Clinical data supporting a cytoprotective effect have been shown in cerebrovascular accidents, with those patients administered EPO 8 hours after the onset of their stroke having better clinical and radiological outcomes . Following animal evidence of antiapoptotic effects in cerebral malaria [99, 100], EPO is currently being investigated as an adjunctive treatment in a phase III trial of cerebral malaria in children in Mali [ClinicalTrials.gov identifier NCT00697164]. Speculation on the benefit of a novel treatment has to be weighed against potential harm. Data from renal patients suggest that aiming for haemoglobin concentrations > 12 g/dl worsens the risk of thrombotic events [101, 102]. An increase in clinically relevant thrombotic events has been shown in critically ill patients, with a 1.5 times increase (7.8% vs. 5.3%) in deep vein thrombosis and a 2.5 times increase in myocardial infarction (2.1% vs. 0.8%) . This occurred in the presence of haemoglobin concentrations < 10 g/dl, suggesting that the prothrombotic effects are not wholly dependent on blood viscosity but reflect platelet and endothelial cell changes . As microvascular thrombosis is felt to contribute to organ failure and coagulopathy in sepsis [1, 2], EPO could exacerbate this problem. The use of non-erythropoietic derivatives such as CEPO may avoid many of the adverse effects observed with EPO. EPO has been associated with worsening of hypertension and hypertensive encephalopathy  but these are less common with treatment nowadays. As sepsis is associated with vasodilatory shock, vasopressor effects could be seen as a positive side effect (see above). The use of EPO has been shown to worsen outcome in certain cancers due to increased thromboembolic risk and possibly EPO-induced tumour progression . This observation raises concerns over EPO use in patients with malignancies who develop sepsis. If used earlier in the course of sepsis, EPO may uncover other unwanted side effects. Serious problems such as pure red cell aplasia due to EPO antibodies are fortunately rare  but clinicians using this drug in a new way should monitor closely for adverse side effects. Attempts at immune modulation in sepsis have proved disappointing for many years, leading to a reappraisal of the mechanisms underlying sepsis in the search for novel therapies. Apoptosis is pivotal in the relative immuno-suppression that can lead to secondary infection and superinfection in sepsis. EPO has known anti-apoptotic effects that have shown, in both animal and clinical models of disease, to translate into clear cytoprotective effects. Coupled with this observation, EPO appears to have in vitro and in vivo effects on vasomotor function, augmenting the effects of other mediators such as catecholamines and endothelins. Reliable clinical data in critically ill patients have led to useful information on the pharmacokinetics [84, 85] and the potential for harm [87, 88, 91]. An observational, prospective cohort study is currently underway to examine the effects of EPO on microvascular inflammatory response in severe sepsis [Clinical trials. gov identifier NCT01087450]. We argue that the weight of evidence has reached a point where further phase II and III clinical trials on EPO would seem the obvious next step. We believe most benefit would accrue from the administration of EPO within 24 hours of the onset of sepsis and organ dysfunction. Optimal absorption would be via the intravenous route and dosing could be guided from clinical studies where ranges between 150 and 600 IU/kg have been used previously. We would suggest doses of 400 IU/kg given on consecutive days for 3 days with close monitoring for thromboembolic side effects [82, 92, 93, 97].